This Silicon Valley Rapid Transit (SVRT) project extends the existing heavy rail Bay Area Rapid Transit (BART) network from Fremont to the city of San Jose and the airport. The project completed final design (65% Phase) and was temporarily placed on hold in 2010 due to funding. It commenced again in 2013. 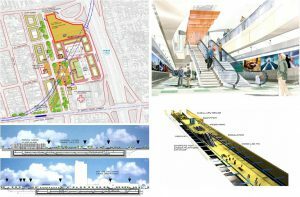 AVA was responsible for the Planning, Architecture, Ancillary Equipment Space Design, and Systems Coordination of (4) proposed underground transit stations. At a later stage, (2) of the underground stations were consolidated into one Grand Downtown Station with crossover. Urban Design presentations for bus transit, parking & kiss n’ ride facilities and intermodal centers for potential Transit Oriented Development (TOD) were made to stakeholders. Four 1000 foot underground stations, each with 700 foot platforms with bus transit centers, parking structures, bridges, intermodal connections with collateral property development during the Conceptual & Preliminary Engineering Phases. Two 1000’ & one 1550’ consolidated station during the Final Engineering Phase.